The Arctic sea ice is disappearing before our eyes as we extended them into space in the form of satellites. Every summer for the last few years the area covered by ice is shrinking during the summer when 24 hours of sunlight give us plenty of crisp images. But what about winter? What about now? And does a picture from space tell us how thick the ice is? 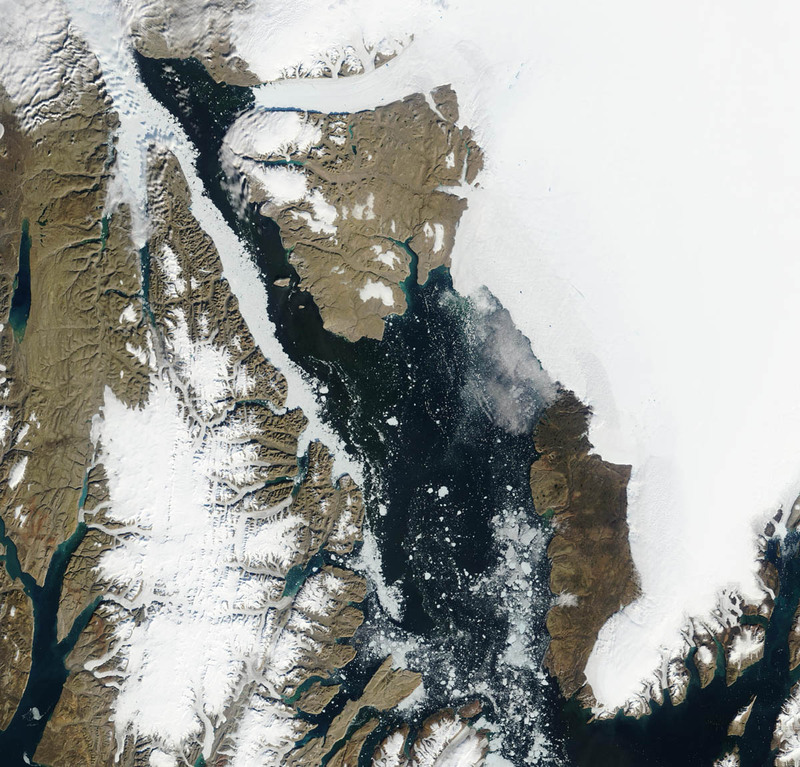 Nares Strait between northern Greenland and Canada on Aug.-13, 2005 with Petermann and Humboldt Glaciers at top and center right from MODIS imagery using red, blue, and green channels. It is dark in the winter near the north pole as the sun is below the horizon 24 hours each day, but there are many ways to “see” in the dark as flying bats aptly show. They send out sound that bounce off objects from which bats reconstruct objects around them. We use radar from space to do to the same with radio waves to “see” different types of ice at night from satellites. We can also use tiny amounts of heat stored in water, ice, snow, and land to “see” at night. Someone breathing down your neck at a cold dark corner will make our heart beat faster as we “see” the heat not with our eyes, but with our skin. I digress, as I really want to talk about icy Arctic seas and how we can perhaps “see” how thick it is with our eyes in the sky. She measures temperatures within the ice and tries to crush it to find out how strong it is. All of this information guides ship operators on what dangers they face operating in icy seas. 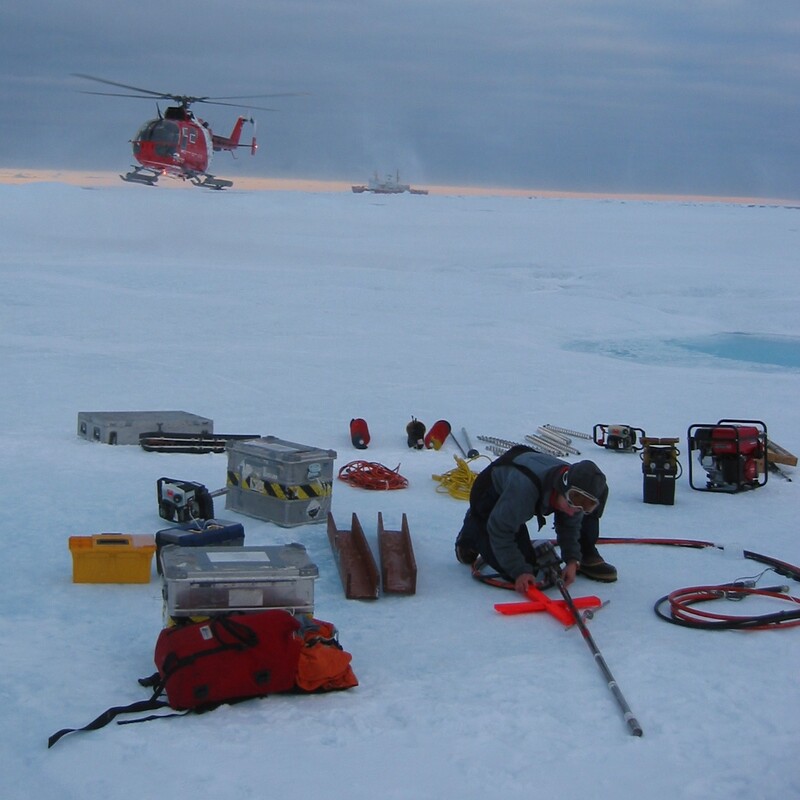 Drilling over 250 such holes across a small floe on the other (eastern) side of Greenland, Dr. Hajo Eicken showed how one large ice floe changes from less 1 meter to more than 5 meters in thickness. 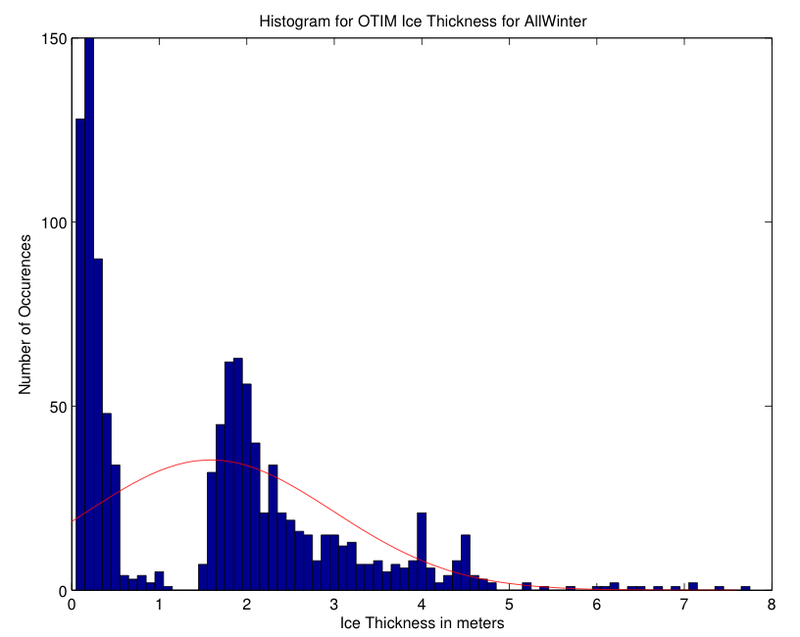 He also discovered that the percentage of thick and thin ice of his single 1 mile wide ice chunk is similar to the percentages measured by a submarine along a track longer than 1000 miles. 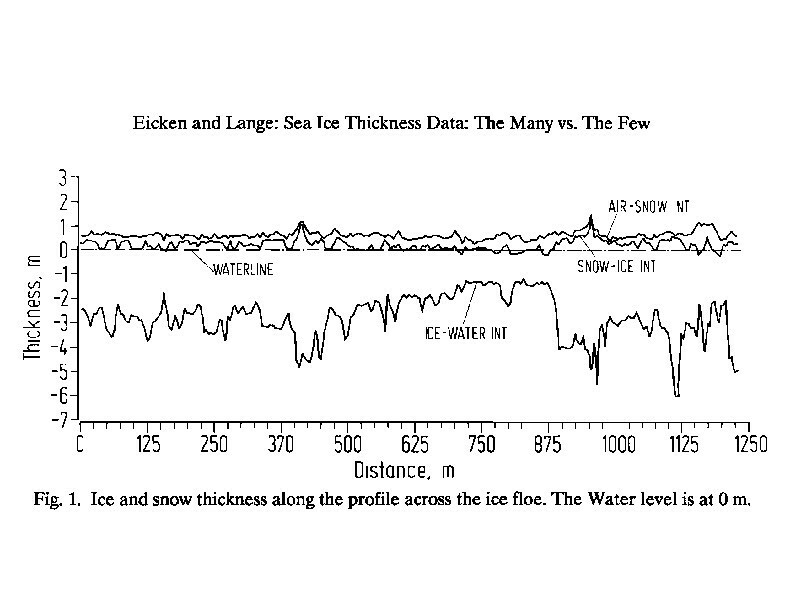 This was a surprising result in 1989 and we use it to estimate ice thickness more leisurely sipping coffee in our office. From the same satellite that gives us crisp true color images in summer as shown above, we get false color images of temperature as shown below. Map of Nares Strait, north-west Greenland on March-25, 2009 showing heat emitted during the polar night from the ocean through the ice, and sensed by MODIS satellite. A graduate student of mine, Claire Macdonald, is trying to convert these temperature readings into ice thickness for Nares Strait. She showed me the first promising results today. The plot below shows the distribution of “thermal” ice thickness for a small square in Nares Strait Dec.-1, 2008 through Mar.-1, 2009 when no clouds were in the area. Note the two distinct and separate clusters with thicknesses below 1 meter and above 2 meters. They represent thin ice formed in 2009 after an upstream ice arch blocked all flow of thicker ice from the Arctic Ocean to Nares Strait. The thicker ice passed the study area at times when the thick, hard multi-year Arctic ice entered Nares Strait freely from the Arctic Ocean. Much work remains to be done: Claire is comparing the “thermal” ice thickness with “acoustic” ice thickness measured by sonars moored in the water below the ice. 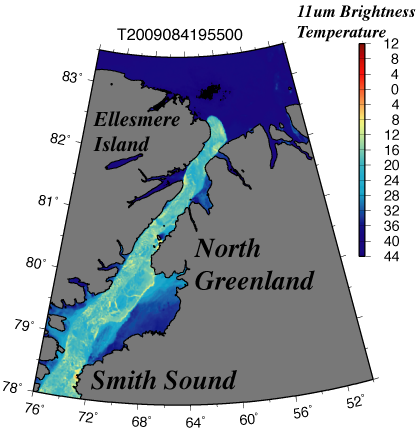 It then will be exciting to explore “thermal” thicknesses for all of Nares Strait. Winds and ocean currents will pile ice up in some areas making it thicker while they spread ice out making it thinner. Claire and I have worked with such wind and ocean data. Science is never finished as each question answered raises a host of new ones. This entry was posted in Ice Cover, Oceanography and tagged acoustics, Arctic Ocean, Greenland, ice, ice thickness, Nares Strait, ocean, probability, temperature. Bookmark the permalink.